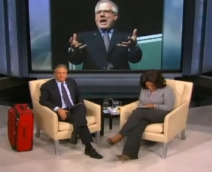 Mediaite has video of Jon Stewart on today’s episode of “Oprah.” Oprah, you’ll remember, is in the midst of the MOST EPIC LAST SEASON OF A TALK SHOW, EVER, and Stewart came to weigh in on many of the same issues he’s been covering on his own show — the “Ground Zero” mosque, the already infamous “Rally to Restore Sanity,” and, of course, Glenn Beck. Stewart’s take on Glenn? “He’s my moneymaker! You know what I call him? My kids college fund!” He’s not wrong! To read the full post and see the clip, click here. Yes! 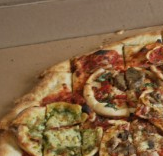 Geekosystem covers the latest development in the pizza-related art world. I’m just going to go ahead and post artist John Rieponhoff’s “Physical Pizza Networking Theory” in its entirety. He says that his latest project “address[es] the ontology of the social as material in art. Using mise en abyme to illuminate a relationship between the layers of material and our experience, and meta symbolic experience of pizza as a hearth, as meeting point, as cultural convergence, as party, as sculpture, as gift, as collage, as pie, and individuals as ingredients within pieces of a social pie adding up to something greater than their whole in a deliciously simple way.” But how does it taste? To read the full post, click here. Styleite covers the ongoing controversy regarding Gabourey Sidibe’s Elle cover, on which the actress appeared looking noticeably lighter than she usually does in real life. Elle’s editor-in-chief insists that critics of the cover are looking for controversy no matter what, and that it was never Elle’s intention to make Sidibe look like anything other than herself. Although the magazine might legitimately not have intended to lighten Sidibe’s skin, the fact remains that the final cover is simply not representative of reality. 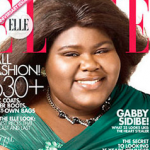 To read the full post and compare magazine-cover Sidibe with real-life Sidibe, click here. On Sportsgrid today: “Dancing With The Stars” premiered last night with the requisite crop of pro athletes, including Kurt Warner and Rick Fox. David Hasselhoff is also in the cast this year, because why not? A surprise of the night, however, was Rick Fox’s dancing ability, as well as his ability to be really tall and have the whitest smile of all time. Though he faces stiff competition in the form of Jennifer Grey, Florence Henderson and Bristol Palin (well…competition, at any rate), he could end up this season’s champion, as the track record for athletes on the show is quite good. To watch the clip and read the full post, click here. Gossip Cop reports that Lady Gaga’s influence is not absolute! Who knew? Despite a Twitter campaign and rally spearheaded by the singer to urge Congress to repeal “Don’t Ask, Don’t Tell,” the law was never voted on after Republicans threatened to filibuster the bill. Doesn’t it seem weird that all they had to do was threaten to filibuster? Shouldn’t they have to go through the whole torturous, reading-the-phone-book, no-bathroom-breaks process? At any rate, party of John McCain 1, party of Lady Gaga 0. For now. Get the full post here.